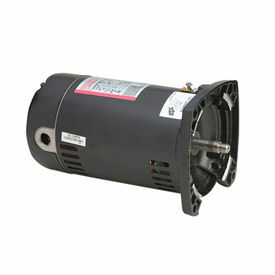 Pool Filter Motors Are Used For Use On Many Popular Brand Jet And Pool Pumps. Great for replacing motors in Sta-Rite, Red Jacket, Pac Fab, American Products and Sears Jet pool pumps. Capacitor start motors have high service factors. Sealed ball bearing motors feature CCW pump end rotation. 303 stainless steel threaded shaft. 50°C ambient temperature. Square flange mount for installation. Single speed, single phase motors have automatic overload protection and open drip-proof enclosure. 48Y frame motor provides up to 3450 RPM. 60 Hz.